will be screening on Sky this May. Yippee! You can watch the trailer here (thanks to The Wertzone for the alert). Going Postal will be a welcome addition to the TV adaptations of Pratchett’s Discworld novels. 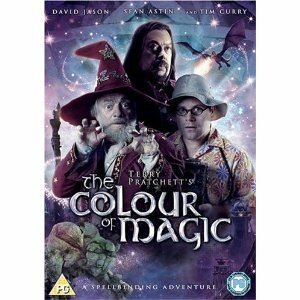 I loved The Colour of Magic and The Light Fantastic and thought David Jason as Rincewind was brilliant. I found The Hogfather to be a little boring even though it’s one of my favourite Discworld novels (if it has Death and his granddaughter Susan, I’m sold). So I’m a little anxious about this one, but am nevertheless waiting for it with bated breath. Which means I must re-read the book again. Currently I’m two thirds of the way through Danielle Trussoni’s Angelology (am still loving it) and have also started Philip Pullman’s The Good Man Jesus and the Scoundrel Christ as I’m going to see him at the Southbank Centre on Monday. Can’t wait! And elsewhere in the bookworld, the gorgeous China Miéville has won the British Science Fiction Association award for best novel for The City and the City (I must read it this year) and his new novel Kraken looks fascinating. I thought Hog Father was dull too and I haven’t seen the others BUT I love Going Postal so I look forward to that. What a coincidence… I’ll be going to see Pullman too! Great minds… See you Monday! 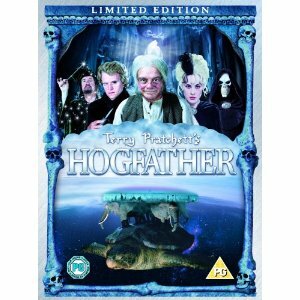 I love Hogfather! The novel, that is, as I’ve yet to watch the adaptation. I’m sad to hear it’s a little dull. The only Pterry adaptations I’ve watched were the older animated ones of Soul Music and Wyrd Sisters, which I thought were excellent. I have started the new Pullman has well! So far, so awesome. That’s fantastic that you’ll get to see him! Hi, I loved the novel too but the tv adaptation was slow. The look was right but the pace was off. Of course you’ll have to watch Hogfather! It’s still exciting to see the Discworld and all the characters come alive.